Jobs in Los Angeles California are not difficult to find if you consider regional industries that are growing or poised to grow. It may well be the case that the entire United States is currently suffering from the effects of an economic recession, but this doesn’t mean that the jobs in Los Angeles California don’t exist. It simply means that you must be smart and proactive about choosing the right industries and sectors likely to offer employment opportunities, and learn what kinds of employees those industries are looking for in terms of education, experience, skills and abilities. This is the key to finding not just jobs in Los Angeles County, but jobs in any location. Searching jobs in Los Angeles California can be frustrating because of the fact that the region as a whole is very job competitive, and the unemployment rate for the region is substantially higher than national average. For instance, the Los Angeles area of California currently employs a labor force of some 4.3 million workers. While this is a substantial amount, the raw figure alone doesn’t tell you that the Los-Angeles-Long Beach-Glendale, area unemployment rate is 12.1%.1 This is almost 4 percentage points higher than the national average of 8.3%. The immediate surrounding Los Angeles areas are often included in government figures for statistical reporting because people commonly commute to and from Los Angeles. 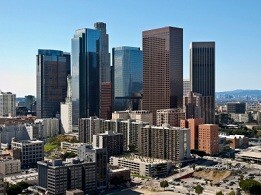 The industry outlook for jobs in Los Angeles County is mixed for 2012 and 2013. The tourism sector is showing improvement with occupancy rates averaging 70 percent in 2011. With continued growth, jobs in the hotel and motel and food and services industry sectors will increase. Private education jobs were added during the recession as were healthcare services jobs and growth is expected to continue through 2012 and into 2013. In addition, Los Angeles has major construction that will be ongoing over the next couple of years which will create commercial construction jobs. The projects include LAX, Metro, the Long Beach courthouse and 2 ports. Residential construction is expected to lose more jobs in 2012. Career resources including job postings and careers in Los Angeles California can be found by searching our online database of jobs at http://www.GoGetterCareers.com. Please read our Welcome Letter, create a free online account and register for Job Alerts. You will be contacted via email when new positions become available. Other top jobs in Los Angeles can be found on About.com under "Top Industries For Career Building in Los Angeles"
The important point is that jobs in Los Angeles County can certainly be found. It simply requires knowing where to look, and equipping yourself with the necessary skills and training to be appealing to the employers in those areas. 2 Kleinhenz, Robert and Kimberly Ritter-Martinez, Ferdinando Guerra. Rafael De Anda. (February 2012). Keyser Center for Economic Research - 2012-2013 Economic Forecast and Industry Outlook. Los Angeles: Los Angeles County Economic Development Corporation.